I gave a presentation at University of Maryland’s Astronomy Department today, Jun 26 on my dust devil work. Here it is. Abstract below. Dust devils are small-scale (few to many tens of meters) low-pressure vortices rendered visible by dust lofted in moderate to high (> 10 m/s) winds. They persist for minutes to hours and can travel kilometers, usually carried by the ambient wind. On Earth, they occur primarily in arid locations and can reduce air quality and endanger small aircraft. On Mars, they occur ubiquitously and likely dominate the supply of atmospheric dust, influence climate, and even lengthen the operating lifetimes of solar-powered landers. Studied for decades, the underlying formation, dynamics, and statistics of dust devils remain poorly understood, but the same technology revolution that brought us stealth drones and iPhones is helping to change that. In this presentation, I’ll discuss on-going field surveys involving miniature, autonomous instrumentation deployed at sites known for dust devil activity. Using a combination of pressure loggers and photovoltaic cells, these surveys are helping to reveal the underlying natures and structure of dust devils in a totally novel way. We’ve found, for example, that not all devils are dusty, but the dustiest devils are also probably the biggest. The most vigorous dust devils occur most frequently during the middle of the day in the summer, when convection driven by insolation is the most active, but low-pressure vortices apparently occur year-round, throughout the day and night. As in astronomical surveys, statistical inference using these results requires assessing important biases, including selection and detection biases, largely unconsidered in previous surveys. Accurately assessing the role of dust devils requires a complete knowledge of their population statistics since the influence of the largest and most rare devils may drastically outweigh that of smaller, more common devils. Had two nice big crashes today with my Blade 180QX. Fortunately, I caught them both on video. Unfortunately, the second broke two propeller arms, so I’m out of commission till replacements come in. Here’s video of the first crash. And here’s the second, more spectacular one. 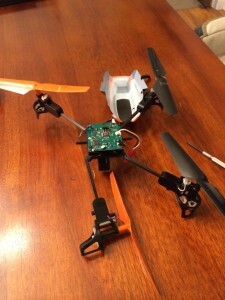 In prep for an upcoming project (and because it’s ridiculously fun), I bought a Blade 180QX multicopter. It’s very easy to fly for someone like me who has no experience, and it comes with a nice camera (although not with the required micro SD card). I shot this video this evening from Boise’s North End, taking off from North Junior High. I got a nice shot of the foothills, downtown, and the capital building. Be warned: the propellers are really loud. Posted in: BSU Journal Club. Tagged: exoplanets, habitable zone, Kepler mission. 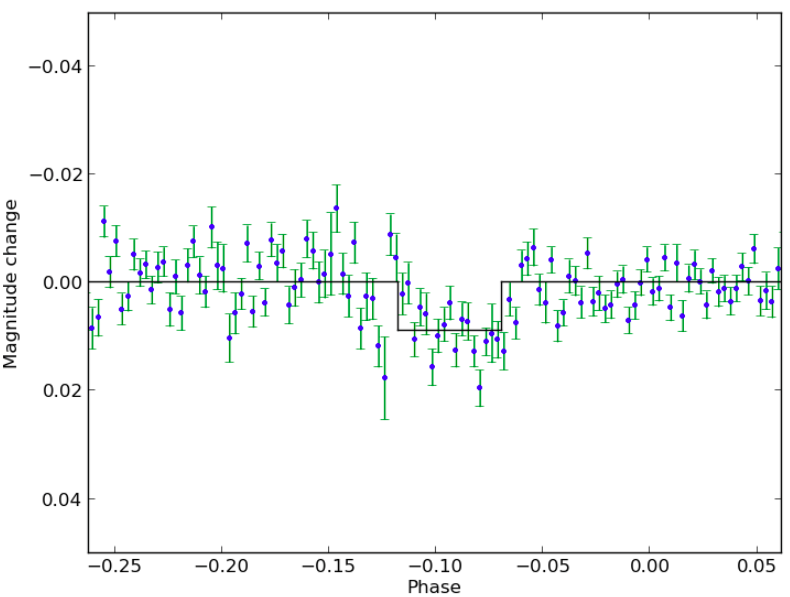 The radii of planets found in the Kepler dataset by Dressing & Charbonneau (2015) as a function of the amount of star light (insolation) they receive. 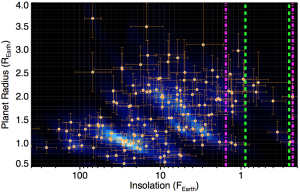 The pink and green lines show ranges of insolation we think might allow the planets to be habitable. In journal club today, we discussed a recent study by Dressing & Charbonneau (2015) that used the Kepler dataset to search for possibly habitable planets around small (M-dwarf) stars. 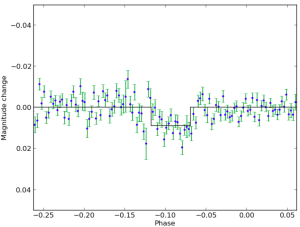 Dressing and Charbonneau applied a sophisticated and comprehensive search scheme to look for habitable planets and estimate how effective their search was in finding such planets. Based on their analysis, they estimated that about 1 in 4 M-dwarf stars have planets about the size of Earth in their habitable zones and that the nearest such planet is about 8.5 light years away. This is far enough that we’d probably still need a generation ship to reach it but a lot closer than one case, 20 light years to the nearest habitable planet, considered by Hein et al. (2012) in their analysis of interstellar colonization. This reduction in travel time could reduce the minimum population required to make the trip from maybe 7,000 to 4,000 people. Of course, the habitable planet sought in such a trip would orbit a much cooler, redder star than the Sun, so the colonists should be prepared to plant very different crops than we have on Earth. Attendees of today’s journal club included Simon Pintar, Nathan Grigsby, Jacob Sabin, Tyler Wade, Liz Kandziolka, Jennifer Briggs, and Emily Jensen.